You Must Be The Change You Wish To See! Change doesn’t happen to you, it happens for you. When change occurs try to accept and embrace that it’s the catalyst to propel you in a different and better direction. Having appreciation at that moment can be difficult but knowing within that everything works out as it’s meant to for the betterment of you and those around you is the silent blessing. Sometimes certain changes push us into directions we ought to have found ourselves but are too preoccupied or unaware to see. Taking your own form of a “time out” to become aware of the benefits behind your changes whether they are apparent at the time or not is a great way to ground and humble yourself. Recognizing and having gratitude for the basics that you live with every day is a good way to keep yourself in check, it’s easy to forget and/or take for granted that they are in fact luxuries. There are many people that can’t perform the basic tasks simply because they have limitations and most of them are grateful for what they can do, are you? It starts with the little things, the little gestures, and this is no different, on the smaller scale if you want to see more people offering a moment of kindness to strangers, then start offering it to strangers yourself. You must be the change you wish to see! It doesn’t matter what end of the scale you are on the concept is all the same and when you start paying attention to the smaller things and having appreciation for them, the bigger things change from wants and needs to “it would be great if it happened but I appreciate what I have” because your level of gratitude has been elevated. As a result more of what is in alignment with your state of gratitude shows up in your life and while it may appear to feel like luck it’s actually just more of what you are starting to gravitate toward and embrace. An attitude of gratitude tends to shift your perception which as a result changes your reality and the way you connect with those around you. We are all universally connected to one another but don’t always realize it because there is so much else going on around us, in our lives and in the world. It doesn’t matter what you call it (God, source, a higher power, the universe) the essence of that which connects us all to each other is very real, even though we don’t always sense and/or feel every other person’s emotions they are there and usually just under the surface. I think we feel and notice more when something on a global scale or more intense level brings that sense of human emotion to the forefront. Connecting with others is the true essence of authenticity because it binds you in such unspeakable ways you can’t even explain, you just feel it. These are the golden connections and are as rare as they are pure, the ones where you almost don’t have to say anything but feel an abundance of love through the connection. It touches your soul so deeply that you feel as one and not because you’ve blended together but because these unexpressed or guarded emotions which are rarely on open display are sitting just below the surface waiting for the right person to inspire them out. The more I see these kinds of conversations and changes going on around me and in the world, the more I believe in the value and promise of positive change. There is no shortage of inspiration for being the changes you wish to see, everyone inherently wants to connect with others, that’s what we are all here for, to make connection. Things get skewed and foggy when presented with the opportunity at times and I think that’s because vulnerability, a large level of openness is required to make the real difference. It is a scary step to take because of fear, fear of feeling too exposed, too open and too available for criticism. Real changes, real opportunities and real moments happen outside of your comfort zone, take a step out there and give it a try, you won’t regret it. 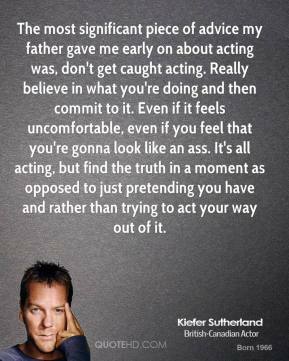 I think what is authentic about this statement I found quoted by Kiefer Sutherland is that I believe it applies to all aspects of life and not just acting which is what he is referencing. 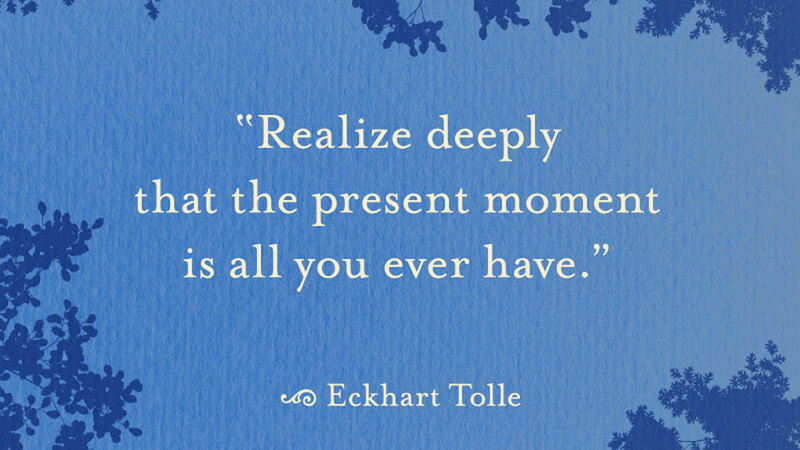 My take from it is that when you “believe in the moment” it is when you are being your most authentic, with authenticity comes a sense of truth. When you are being genuine with others it is felt, recognized and appreciated and as a result reciprocated. When you trade the protective walls of personal security for authenticity you increase the opportunity for connection and I believe “being the change you wish to see”.